Pros: A unique and exciting venue. Wonderful artistry. Great atmosphere. Suitable for all the family. Cons: What felt like an abrupt ending. A unique and magical way to experience Dickens’ classic Christmas tale. There is perhaps no story more in the spirit (excuse the pun) of the festive season than Charles Dickens’ A Christmas Carol. If you are an adult, it is likely that you will have encountered Ebenezer Scrooge in some form or another over the years, and will know and love the story well. I had never seen it as a puppet theatre production however, and whilst the story and the characters were unchanged, the Movingstage Marionette Company bought this classic tale to life in a unique and magical way. Whether you are familiar with puppetry, or like myself know very little about the art, I think you will find this version of A Christmas Carol a very exciting and enjoyable theatrical experience. To start with, Movingstage is based at The Puppet Theatre Barge which is exactly that – a barge. Moored on this occasion in Little Venice. From the outside its branded banner and coloured flags are the only real giveaways that this is no ordinary barge. But as I stepped down inside, I could feel my levels of curiosity and excitement rising. Tardis-like, there is a small foyer with a simple cafe, beyond which is the theatre itself with raked seating for up to approximately 40-50 people. Even the stage is bigger than it first appears, with staggering depth allowing for the layering of locations within the story. Ten minutes after arriving I was already filled with wonder and the curtain had only just gone up. The performance itself followed the traditional story. Businessman Ebenezer Scrooge is miserly and ungiving. His cries of ‘Bah Humbug!’ to all those who wished him a Merry Christmas were met with delighted recognition from the audience. 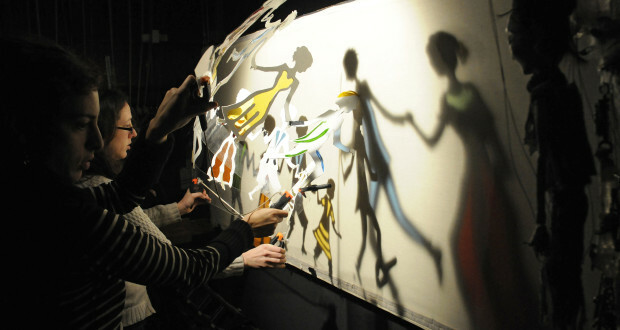 There was a mix of two styles of puppetry throughout the show. 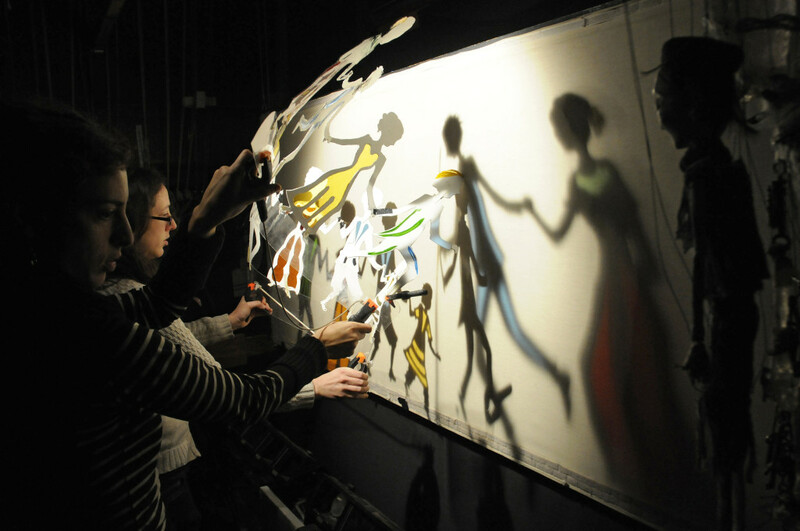 Each main character was played by a marionette, whilst smaller characters and scenes, such as Mr Fezziwig, were created using shadow puppets. The blending of these two styles was seamless and gave the performance a changing dynamic, without which the use of either style alone might have become monotonous. I found the artistry with which the marionettes were manipulated astonishing. The most delicate of movements gave breath to the puppets and they moved perfectly in-sync with their character voiceovers (which incidentally belonged to a number of well-known actors, including the acclaimed Simon Callow). 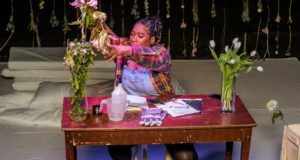 The show’s other production values including lighting, music, set and costumes likewise all blended effortlessly to create the magical and ethereal world of the story. I was captivated throughout as to how even the simplest of techniques were used to great effect and ignited my imagination. The use of smoke as the smog of Victorian London for example, or the rotating hand drawn images of the rolling hills from Scrooge’s upbringing. Far from the sometimes more commercial theatre that many of us have become accustomed to, this was storytelling pure, simple and beautifully effective. The only drawback for me was the abruptness with which I felt the story ended. No sooner had Scrooge vowed to change his miserly ways, then Tiny Tim’s closing line was delivered, a resounding ‘God bless us, everyone!’. I would have enjoyed seeing more of the changed Scrooge, perhaps dancing with his nephew or surprising Bob Cratchit with a raise. I also felt the reveal of the children ‘Ignorance’ and ‘Want’ during the scene with the Ghost of Christmas Present, was old fashioned and difficult to grasp as a concept. This would have been particularly hard for the children in the audience to understand. The story would still have been strong if this part had been cut or updated in some way. These elements however, did not detract from my overall enjoyment or experience of the show. Whether as a child hearing the story for the first time or as an adult revisiting it again, Movingstage’s production of A Christmas Carol is a unique way to enjoy a Christmas favourite. Vicki is a dance and theatre studies graduate, specialising in Shakespeare and Early Modern theatrical practices. She moved to London to study and stayed for the arts, theatre and life that the capital brings. 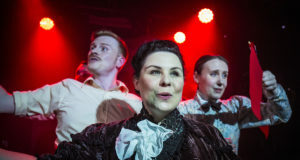 By day she works in heritage education, by night you'll most likely find her tap dancing, taking photographs, browsing vintage clothes shops for anything 1940s, or in the upstairs room of a pub performing improvised comedy in the style of film-noir.